Yes and no, say the experts. The heated debate over school uniforms shows no signs of cooling off. 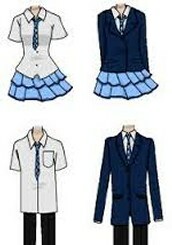 For the past decade, schools, parents and students have clashed over the issue of regulating student attire. In 2007, cases involving an anti-Bush T-shirt in Vermont, and Tigger socks in Napa, California, made their way through the courts, causing many to wonder whether this debate will ever be resolved. • Help prevent gangs from forming on campus. • Help students resist peer pressure to buy trendy clothes. • Help identify intruders in the school. • Diminish economic and social barriers between students. • Increase a sense of belonging and school pride. Even though they say this about the children. They need to express themselves and show who they really are inside. 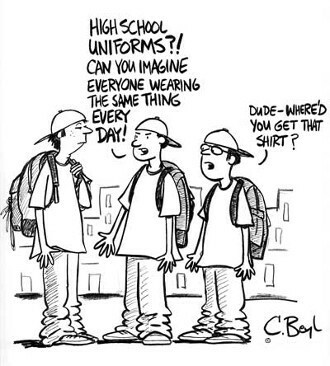 Think about the children's feelings about the uniform if a child grew up in a uniform school they would feel comfortable wearing uniforms, so now its up to the parents to take their children to the type of school they want.